...well, at least nothing died this week. But, that did seem a little dismal. (even for me) Although considering the tone my last two walkabouts had taken, no loss of life really was good news. Except late in the day the survival of the cucumber and broccoli transplants seemed somewhat tenuous after an unexpectedly hot and sunny afternoon. So, a different opening line was definitely in order. Sometimes I wonder if I have written all the words, described our life in full, finally hit the wall and have no more interesting copy to share. Finding something unique to write about is becoming a challenge. There is definitely a down-side to twenty years of repetition. The week began with one of those things required of “responsible, mature adults”. At the risk of oversharing, it was time for me to have a colonoscopy. While this might not seem farm-related, managing our health is imperative to the sustainability of the farm. I figured if we scheduled it for first thing Monday morning, the week was guaranteed to get better. Everything went fine and the week did indeed improve, so we’re done with that subject for another ten years. When we were in the midst of everything in March, it seemed that getting back to “normal” would never happen. But, we’ve been making slow and steady progress toward getting the farm schedule back on track. To that end, we hauled all the shearing equipment out back to give Angus his annual “haircut”. There is only one rule to handling Angus...give him feed! He is actually quite docile (as long as there is food, or the possibility of food). The Boss knocked the shearing job out in record time. And, underneath that wool, Angus is massive. He has reached his mature size and he is impressive. We shall see if the ewes share my favorable opinion when breeding season starts in August. he thought maybe the wool would be good to eat! With that job out of the way, it’s time to focus on the gardens. For the next couple of months, vegetable harvest and processing will be the watchwords. My path back from morning chores includes a route through the gardens to check for potential harvest jobs. Sometimes this causes an adjustment in my plans. When I found GREEN BEANS just perfect for picking...we both re-arranged our plans for the day. Because picking is always priority one. And, the green beans require all-hands-on-deck. 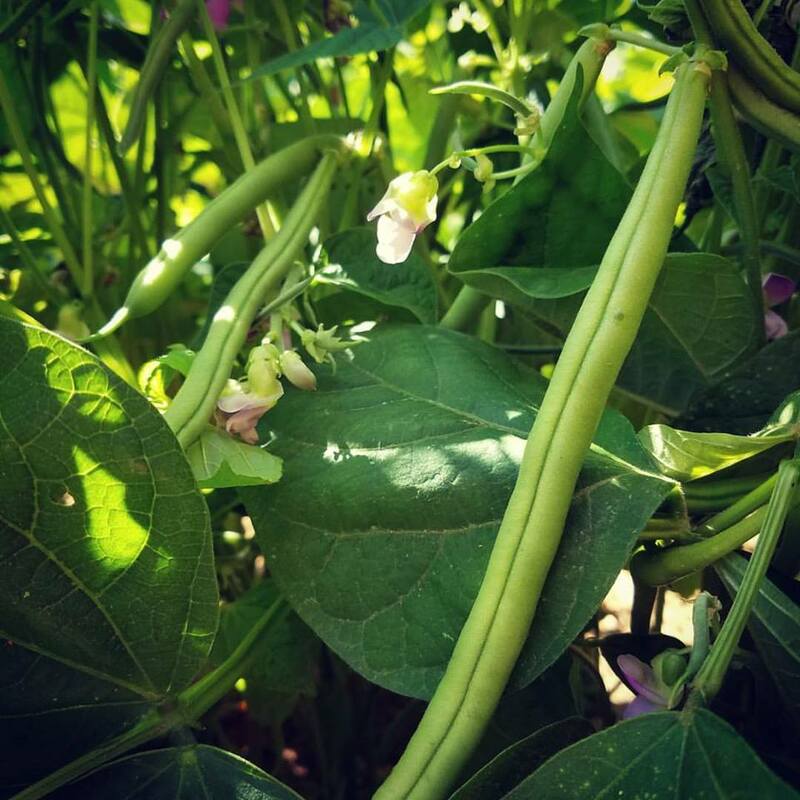 One of my internet friends (who is also a vegetable producer) posted the comment “#backbreaker” under my photo of the first green beans of the season. She gets it. She knows. There is no easy way to pick green beans. You might want to read THIS. 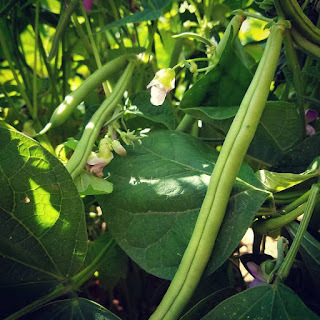 I am certain some enterprising person could come up with a fitness program based on solely on green bean harvest. All that produce checking/harvesting paid off. It was an incredible Market day. Not just for us, the Market (as a whole) set an earnings record! It turned out to be a beautiful, busy day. Staunton’s most popular band performed and there were droves of people. But, no matter how great the Market is, how much we enjoy the interaction with our friends and customers, there is no place like home. But, we did have to head back out again. This weekend we are doing a little “critter sitting” and headed out to the Draft to feed our daughter’s menagerie. With everyone fed, watered and accounted for, we returned to the hill, where the vegetable bounty became supper. Thanks for stopping by! Come back and “visit” again real soon. You can visit the Market "virtually" by clicking HERE. I adore your daughter's rooster Barbara. Don't you dare to stop blogging as you suggest - yours is one of the first posts I look at as I so enjoy reading of your week's exploits. I really don't intend to stop blogging, Pat. But, it is hard to think of an interesting way to write about the same thing over and over. I agree with @theweaverofgrass. I love reading this blog every day. And I pray for you when you need it...and even when you don't. :) You can always do a picture post or one specifically about the market even. highlight a vendor maybe? Thank you, Barbara! I truly appreciate your kind words. I like your ideas for different blogging approaches. Sometimes finding a creative way to write about the week is the biggest challenge. Hi Barb: I love your comment about the ram and loving his grain! I too have a very large and intimidating ram - he is close to 200 pounds. But, with his grain in front of him - I can go in and change his water and work around him with no issues. I just make sure I am out of his way when the grain is gone! You and the boss are so inspirational - working with the land! Thank you for your posts! Thanks for reading and commenting, Tracy!